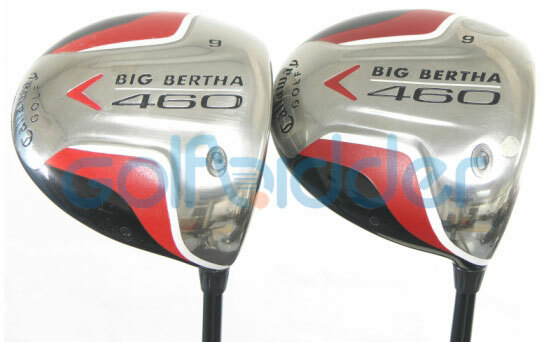 The first thing you need to know is that no counterfeit clubs are sold on Golfbidder. Never have been and never will be - so right away you can relax! However, on some websites which allow members of the public to buy and sell directly amongst themselves - counterfeit golf clubs are a very serious problem. With a lot of counterfeit goods (eg Gucci handbags or Rolex watches for £10) it’s pretty obvious to the buyers from the low price that they are buying a fake. With golf clubs this is rarely the case. To avoid suspicion, sellers of counterfeit golf clubs tend to charge the same prices you would expect to pay for the genuine article. It’s a problem not only for the hapless buyers – but for the whole golf industry. This was evidenced recently when one of the biggest counterfeit golf club scams in history came to light – for more on this story click HERE. The counterfeiters are getting better – and it’s getting harder for a layman to spot the difference; It could be the colour of a decal, the step pattern of an inferior steel shaft; the fact that a magnet clings to a supposedly titanium head (magnets don’t cling to titanium) - numerous subtle differences. But hit a counterfeit club after a real one – and you’ll soon know the difference - the performance is invariably dreadful. How Come Golfbidder Doesn't Get Caught Out? Extreme diligence is the real answer: Our expert inspection team, made up of PGA Qualified professionals, personally handle tens of thousands of clubs every year. Every club is minutely inspected to ensure it is in the condition we expect – and then every one is individually photographed in close-up - and then described. The team has been with us for years, they take genuine pride in being able to spot a fake – they have seen thousands of the genuine articles, and on the rare occasions when someone sends us a counterfeit (having unwittingly bought it elsewhere) it stands out like sore thumb. There is not space to reveal all the tell-tale signs that mark out a counterfeit from the genuine article – but here are just a few examples of the sort of discrepancies which give the game away. To view the latest offerings from the counterfeiters please visit us on our Facebook page. We have new images going up on a regular basis as well as loads more content to help you in your quest for golfing perfection! First of all let’s say how delighted we are that the counterfeits coming through our doors are now very few. Trade in fake golf clubs is drying up, with the action taken by the authorities to date clearly having the desired effect. However the odd one does come through, but our team are quick to spot it – like they were with this Scotty Cameron Newport 2.5 putter. We didn't have a genuine '2.5' in stock but we compared it to a '2' for the photos. Looking at the images attached there are a number of obvious flaws you can look out for. In these examples the fake is on the bottom or in the foreground. Headcover – look out for poor quality stitching and generally ‘cheap’ feeling. 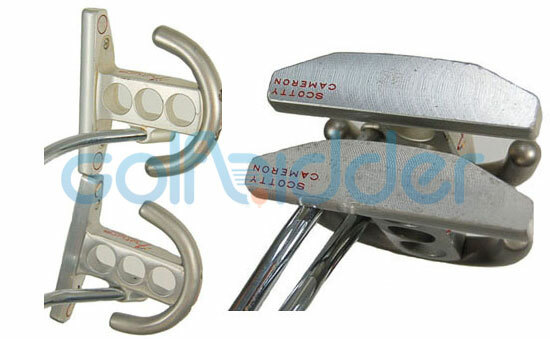 Lighter finish – much lighter in the fake putter. Hosel – absence of ‘Cameron’. Sole – the weights not sitting flush or fitting as they should. 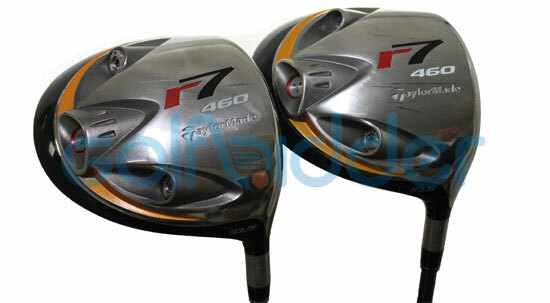 It hasn't taken long for the counterfeiters to being duplicating the TaylorMade R9 driver. In this example the counterfeit is on the left. There are only minor discrepancies but if you know what you're looking for they are a little more obvious. In this first photo the edges to the white sections on the counterfeit are not as sharp as the ones on the genuine club from TaylorMade. The differences in this photo I'm pleased to say are a little more obvious. The first is the fact that the letters on the furrel that state the setting the club is on are upside down on the counterfeit. The next is not so obvious but you'll notice the hosel is slightly longer on the counterfeit. Subtle but once you spot them you can see them clearly. 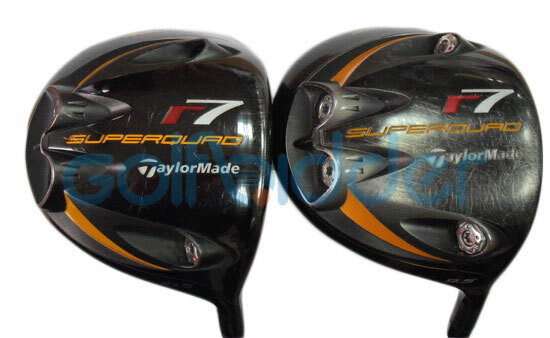 In this example the counterfeit TaylorMade R7 SuperQuad is on the right hand side. The first thigh you'll notice is the condition of the sole on the counterfeit. Both of these clubs are used but there are many more scratches on the counterfeit. 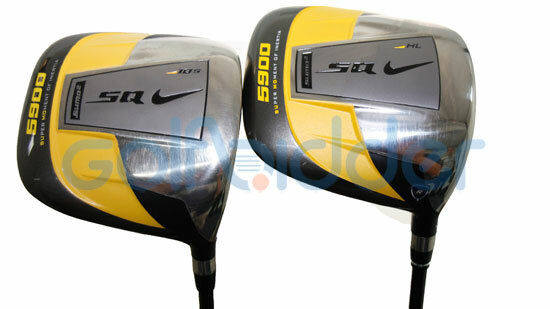 This show the quality of the paint used on fake golf clubs is a lot poorer than that of the genuine articles. Here we have one of the most popular fairways of the last few years. In this example the counterfeit club is on the left. As you can see the red paint use is slightly lighter than that on the genuine article from Callaway. 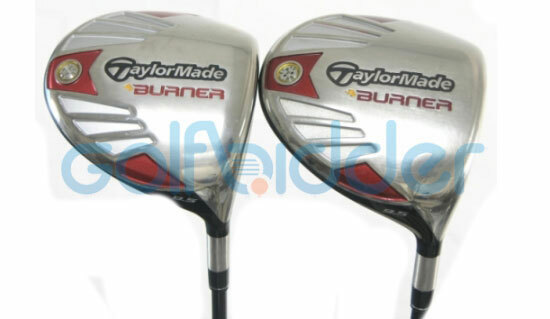 You can also see that the width of the red section on the counterfeit is wider than on the real club. They are only subtle changes but if you know what to look for you can spot them. 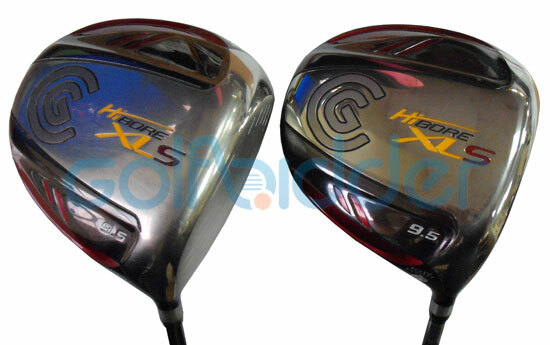 At first glance - and maybe a more detailed look - these Cleveland HiBore XLS drivers look exactly the same. One difference in this image is the grey fill on the Cleveland logo. On the genuine club (right) it is a nice smooth finish, high quality paint and application, whereas on the fake it is an uneven finish - poor products and application. Another difference is on the toe. The cream coloured triangle displaying the Cleveland logo is not the same on the counterfeit - it is a pure white paint. These Cleveland HiBore XLS drivers are very good quality so please make sure you buy from a genuine retailer or you’ll think you’ve crashed one off the first tee only to come up 100 yards behind your playing partner! 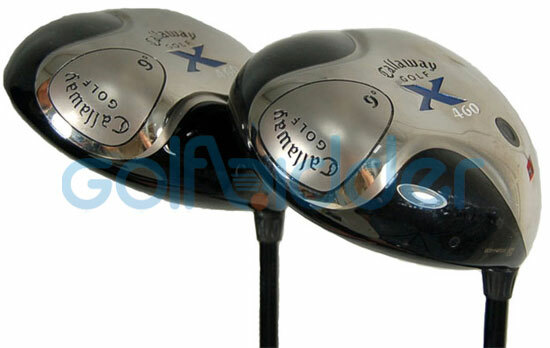 One of these is one of Callaway’s superb long-hitting X460 driver manufactured from pure titanium. The other is a cheap imitation which hits the ball considerably less distance. 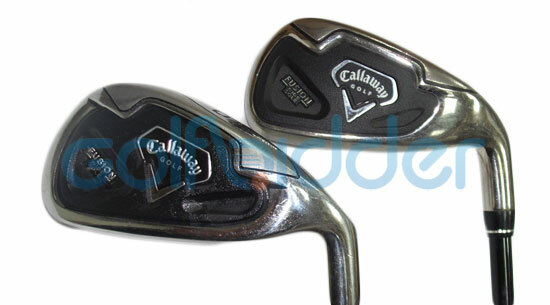 The fake, here, is on the left – note how the number 9 denoting the loft is a slightly different font – and how Callaway written on the side is less defined. 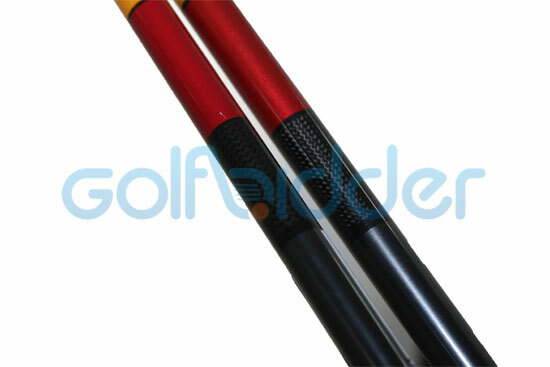 Note also that the plastic ferrule – which covers the join between clubhead and shaft – is slightly thinner on the fake. A top view of the same clubs. The fake has a white alignment arrow, whereas the real deal has a more subtle silvery grey arrow. Yes, the one on the left is destined for the bin! 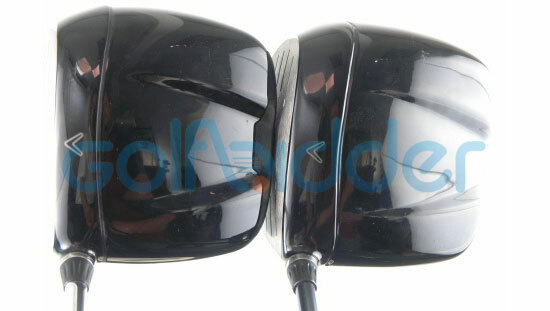 The heads on the TaylorMade r7 460 drivers are uncannily similar – even the fonts are pretty close – although the shade of orange on the crescent isn’t quite right. (The counterfeit is the on the left by the way). Where the crooks have really let themselves down is with the shafts. On this close-up you can see the graphite weave of the stock TaylorMade RE-AX shaft on the counterfeit (below) is not actually graphite weave but has been painted on and looks less pronounced. To the untrained eye, the counterfeit driver (left) is not immediately apparent; the main giveaways are that the yellow paint is not quite the correct shade – and the casting of the raised triangular shards within the yellow section are not as crisp and proud as the genuine article. Despite their huge popularity, there tend to be much fewer Ping counterfeits around than some other major makes. 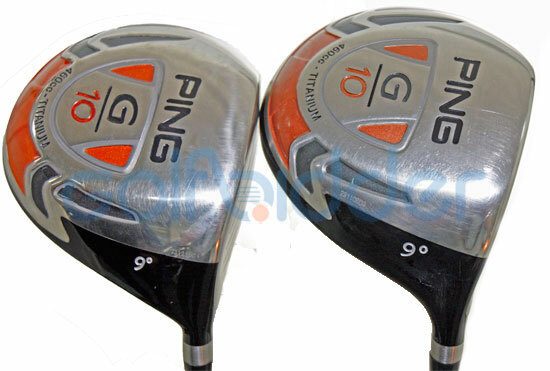 Here’s an exception – the counterfeit G10 driver is on the left; the orange fill is too bright; the engraving for the words Ping and G10 not as crisp or defined – nor the number 9 denoting the loft. 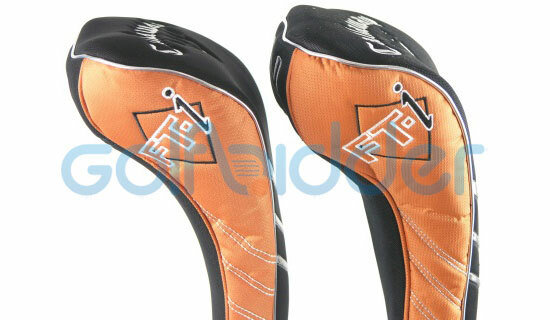 Headcovers are also counterfeited. 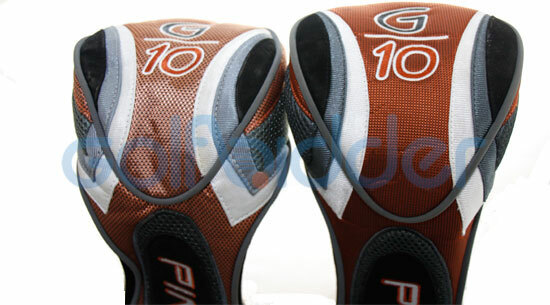 Note the different colour on the fake Ping G10 headcover (left). The same clubs as above, but viewed from the top. Again the fake is on the left. Difficult to see in the photo but the web-type lines in the light-grey areas are thinner and not as defined. It would be almost impossible for a layman to notice difference – so our advice remains as ever – only buy clubs from a source you know, trust – and have recourse to if you subsequently discover the club is a fake. A little easier to tell apart than the TaylorMade above, you can see that the font used for the number 9 denoting the loft is slightly different on the fake (left). 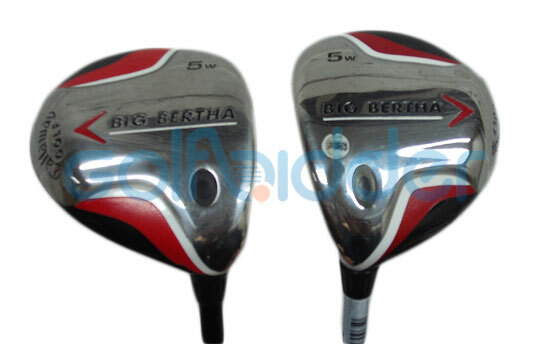 The letters used in ’Big Bertha’ are a little thinner; the sweeping white line at the bottom reaches all the way to the ferrule on the fake, whereas on the real one it stops short; the red paint used is also a little too bright. 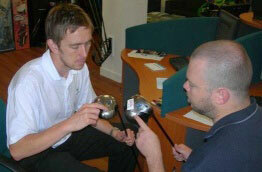 On the right, Callaway’s best-selling FT-i driver. On the left, a cheap imitation. The cosmetic differences are not immediately obvious unless you are inspecting dozens of genuine FT-Is on a daily basis; Note how the three squares denoting whether draw, fade or neutral model are fractionally bigger on the fake; the black plastic ferrule covering the join of the shaft to the head is slightly thinner – and the metal band slightly wider. The writing on the (supposed) serial number sticker on the fake is not as defined, the font used in the figure ‘10’ to denote loft is also slightly different. There is a small – almost invisible in this picture – round hole covered in black paint on both (close to the red/black paint divide immediately below the large ‘F’ of FT-I): On the fake it is recessed, on the real one it is proud. Note the dividing line between the silver area where the arrow is and the red area – the crooks haven’t got it quite the right shape – and it is not as crisp. 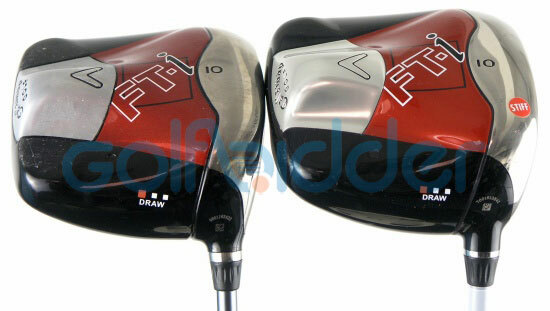 A top view of the same clubs – and again the fake is on the left. Note how the band enclosing the arrow on the fake is slightly thinner – and that the arrow is a slightly stronger colour. Headcovers are also counterfeited. The one of the left is the fake. Note how the ‘F’ of FT-I is much closer to the beading edge than the genuine one, and how the white stitching is spaced differently. One of these clubs is a genuine Nike SQ driver – it has thinner but more defined face lines, with crisper edges and a cleaner finish. Got it? Yes, the fake is on the top. The shafts are of the same clubs – and again, the impostor is the top one. Note the stronger blue and more defined decals of the genuine (bottom) one. Again the counterfeit is on the left and as you can see from the photo they are very similar! Like the driver the fill on the Cleveland logo is a slightly different colour. In addition to this on the hybrid the step towards the toe is not rendered as smoothly on the counterfeit as it is on the genuine article. Here we can see the main difference between the fake and the real one! The fill on the white triangle is more of a beige/cream colour on the real Cleveland club. On the counterfeit as you can see it is a pure white fill. - this is the same case on the fake XLS driver. 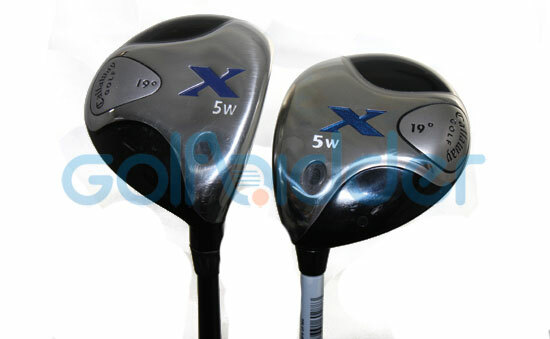 At time of writing, we only had a genuine left-handed X fairway 5 wood in stock to demonstrate the difference (so the eagle-eyed will have already deduced that the counterfeit is on the left). Unlike some of the other examples on this page, this was not the crooks’ finest hour. Almost everything is wrong – the font for 19 degree and 5W, the ferrule, the colours. In addition, the club as you can see is noticeably larger than the genuine article. It looks obvious here, but in isolation it would be easy to be fooled – as was the poor chap who tried to sell it to us and who had no idea it was counterfeit. 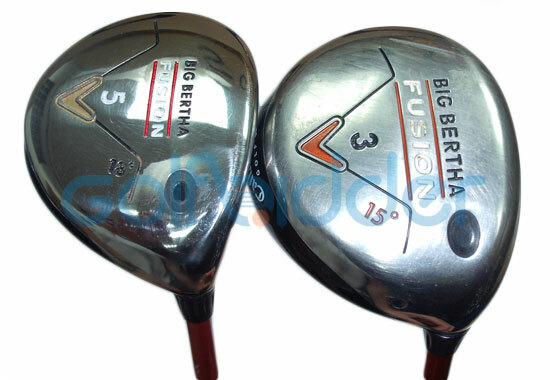 It is not until you see both of these Callaway Fusion Fairways next to one and other that you begin to see the slight differences between the counterfeit (left) and the genuine article (right). The first thing you notice is the different colour paint used on the chevron. In fact the paint on the genuine had just worn away - a prime example of how costs are saved when counterfeits are being manufactured. You can see the original colour is still different on the orange lines - much brighter on the counterfeit. The other difference is the loft. On the counterfeit it is black and on the real thing it is orange. Only a subtle change and you would not notice unless you were comparing them with each other. 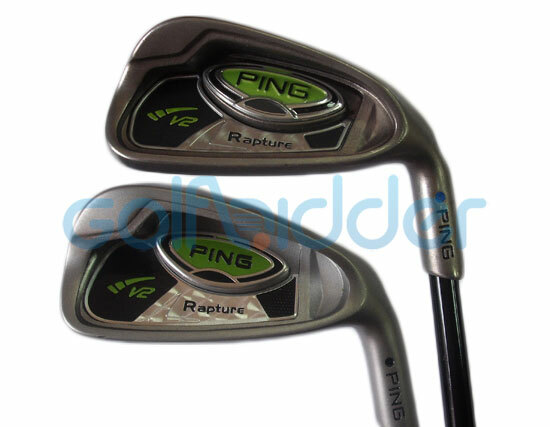 As soon as you lay your eyes on this pair of Ping Rapture V2 irons you can see that something’s not quite right. The first thing that you notice is the finish of the actual club head. 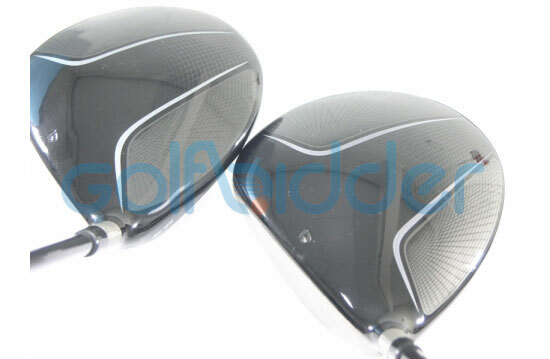 The genuine club on the right is reflecting the light much better than the counterfeit on the left. The genuine club has a more polished finish while the counterfeit has a more brushed look. The next major difference comes in the form of the brand badge in the cavity. On the real article there is a high quality badge that is set in to the head mould where as the counterfeit has a much cheaper alternative that does not have the same contours as the real. 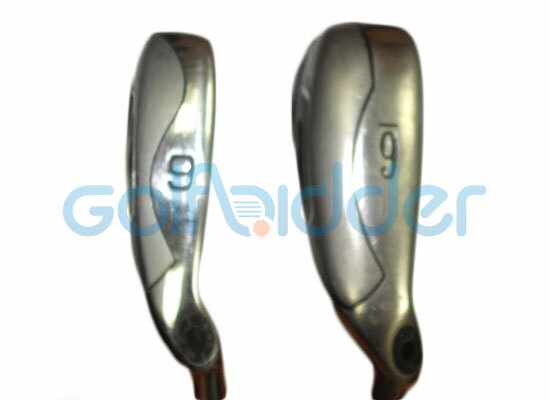 This next photo shows the shafts of the genuine club (top) and the fake on the bottom. As you can see when you’re in a position to compare the 2 the differences are apparent - however as a standalone product these shafts are quite accurate - but of course would not give you the performance of the genuine article. This copy of Callaway’s latest X-22 irons would be unlikely to raise alarm bells unless you had a genuine set to compare it with. The counterfeit is on the left. The colour of the blue badge within the cavity is not as strong, nor does the raised ‘X’ doesn’t have the quality of the original. The overall finish and the fact that paint sometimes spills from the engraved lines marks it down as a clear impostor. 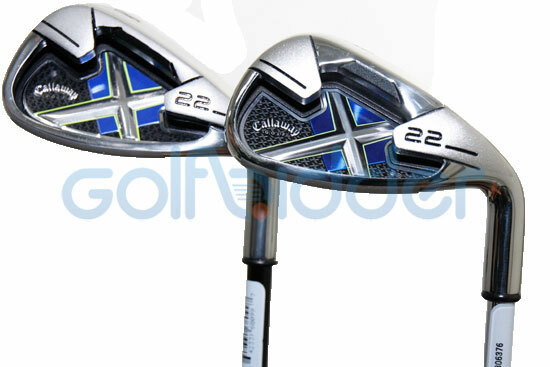 The club on the left is a Callaway Steelhead X-16 sand wedge. The one on the right is not. The real club on the left has a hologram ‘X’ in the blue medallion which is only visible from certain angles – the ‘X’ on the counterfeit is always apparent; The font used for X-16 is slightly different; the blue medallion on the fake (right) is too bright in colour; the 54 degree engraving shallower and less defined. It’s not too hard to see the difference here! 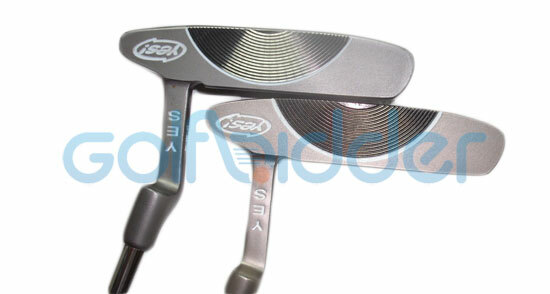 The genuine club on the right is a true wide sole iron while the fake on the left is a normal width with a wide sole sticker. Another thing to note is the different font used on the number - and the underline used on the genuine club. From the back we can see more differences. The badge displaying the ‘Wide Sole’ text on the left is from a cheaper print run and is starting to peel away at the edges. The genuine is still fully stuck to the carbon insert. 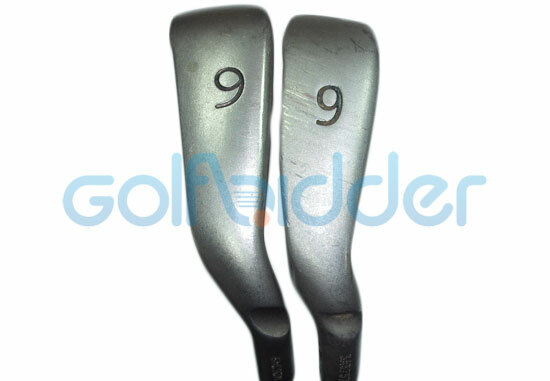 At a glance these 2 Ping G10 irons look identical. However on close inspection we can see that one of them is beginning to rust - no prizes for guessing that this is the counterfeit. The rusting in the cavity of the fake club shows the poor quality finish applied by whoever manufactured the head while the genuine article is still in fantastic condition. The Ping badge is also much thinner than on the real club and the edges of the cavity or much thicker. The more eagle eyed of you will also notice that the black dot on the hosel of the fake club is smaller than on the original. 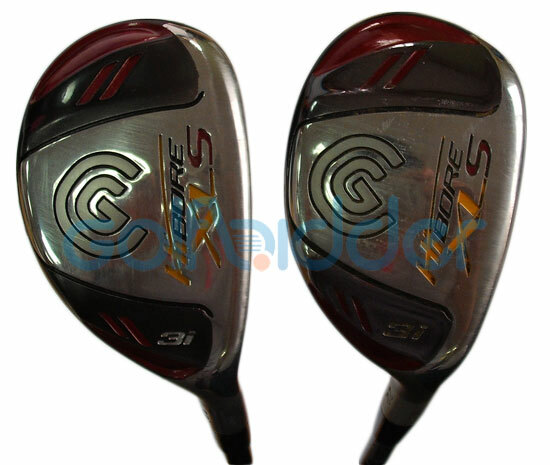 There are some more subtle differences when comparing the soles of the clubs. 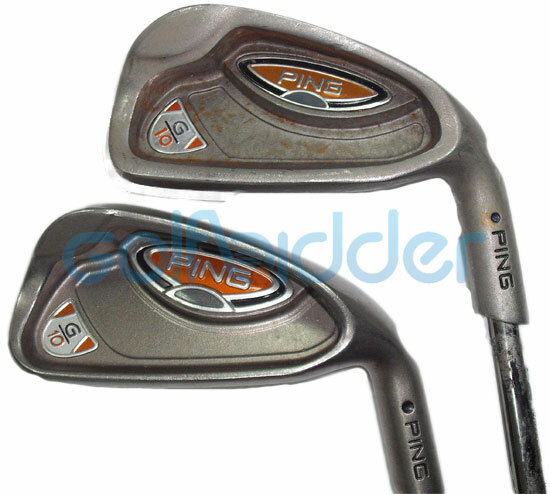 In this photo the genuine Ping G10 iron is on the left and the fake on the right. The font used for the number 6 on the fake club is clearly a generic font, rather than the more stylish font used by Ping. One thing worth noting is that the fake club has had a serial number stamped into the hosel – so be warned – just because it has a serial number does not make it genuine! One of these putters is made of precision-milled stainless steel – the same club is used by some of the best tour professionals in the world – and it sells new at £199. The other one is a worthless piece of alloy - but may still sell at £199 to an unsuspecting buyer. In both photos, the counterfeit is the bottom one; it has a different score pattern on the face; the words ‘Scotty Cameron’ are not as crisp; most importantly – the metal used is a cheap zinc alloy which dents easily when struck – stainless steel does not. 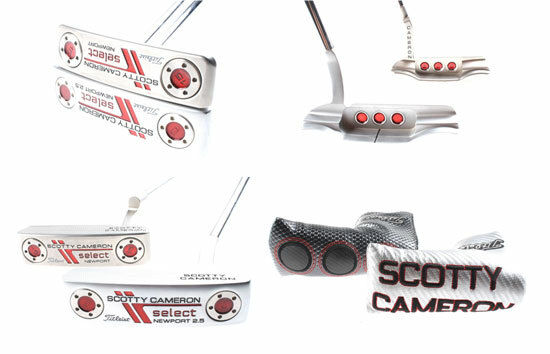 It’s the ‘feel’ of the thing which initially sets the alarm bells ringing – but in isolation, the fake could easily be accepted as genuine by someone who does not handle many real Scotty Cameron putters on a regular basis. The fake (below in our image) looks very similar from a distance, so you can see how the crooks are getting away with it when you have nothing to compare it too! You can see from the image that the materials used are not the same, shown by the difference in colour of the C-Groove in the fake version, which is lighter in shade and also less reflective. The inner most curve on the counterfeit putter is also much thicker than the original version, most likely as a result of less accurate manufacturing and probably cheaper tools used in the milling. Other differences, not shown in this image, are that the Yes! Callie is made with a stepless shaft - which was not match by the crooks - and the grip was a very poor imitation made from a much harder rubber. If you have any queries about counterfeits – or if you’re unsure of the provenance of a club you have - feel free to email a jpeg of the item to pros@golfbidder.co.uk or pop into our showroom in Surrey and we’ll be more than happy to provide whatever help we can. Alternatively you can call our expert team on 0208 401 6901 to discuss any issues you may have.